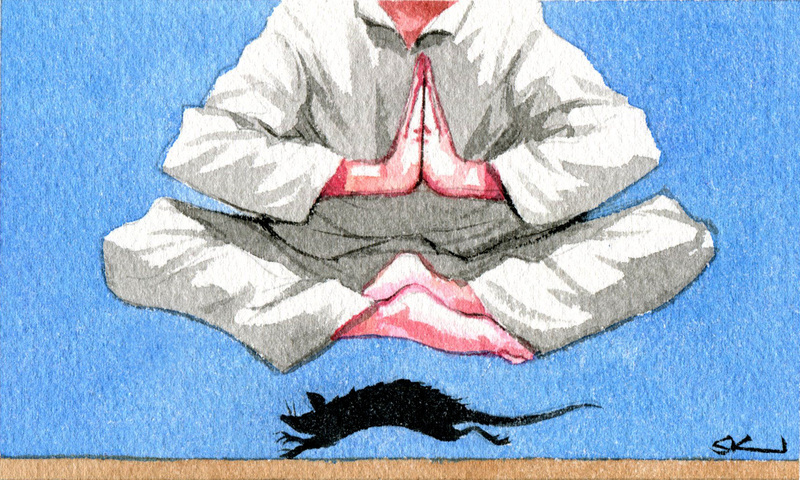 Person in lotus position levitating with a rat running under them. IT was the weekend from hell. An impossible amount of things to do and worry about. Two major stories due in, a removal van coming to take away several pieces of furniture and deliver new stuff, a daughter arriving back from abroad needing airport pick-up, and a close friend in crisis. There was going to be no time to eat or sleep if I were to get through. I was running around the house with a vacuum cleaner and rag trying to get rid of the hideous dust that settles behind furniture, before new furniture arrived, desperately late for an interview, when my cat let out a huge meow. He was bleeding. I rang the vet hospital and was trying to squeeze him into his cage scratching and screaming, when out of the blue my other cat came home and proudly lay a whopping rat on the kitchen floor. The first time he’d ever done it. The poor thing wasn’t dead and began what can only be described as an excruciating death roll around the floor. But does any of it work? I’ve sat on mountain tops in bliss, but what about when you bring enlightenment back to the real world? Can it help in the face of reality? Jack Kornfield, father of Buddhism for frazzled Westerns, author of bestseller A Path with Heart, wrote about returning to Manhattan after many years in spiritual retreat and within hours wanting to throttle someone. The great mindfulness teachers talk about detachment — recognising the panic but staying removed from it and breathing deeply. Hyperventilation through shallow breathing increases the fight-or-flight response and chemical release. I’ve failed so many times. But for the first time, I did it. I dropped into a state of mental calm, I let everything go. I made clear decisions. The rat needed to die peacefully. I picked it up in a container and put it behind a tree. I answered my calls and told people there was an emergency. I darted off to the vet. I delegated the dusting, and let myself name the panic but detached from the crisis looking down as if from above. Everything turned out fine. And if anyone has any doubt about the value of meditation, me standing calmly in the kitchen holding a dying rat in a plastic cereal bowl is 100 per cent proof that it works.